The front side is divided in 23 sections with diagonal route. 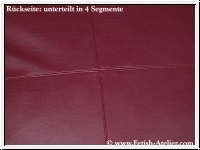 Each section is sewed with decoration seam, the back side is divided in 4 sections and also sewed with decoration seams, so you have one pillowcase and two looks. At the bottom side of the pillowcase is a zipper, invisible stitched. 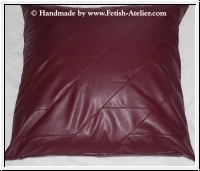 We sew the pillowcase after your order in our own atelier in the standard - size 80 cm x 80 cm.